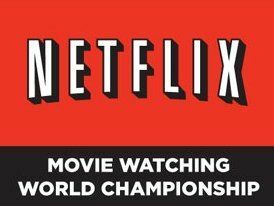 Right now in Times Square there are just two participants left in Netflix's annual Movie Watching World Championship. Trying to stay awake, the movie-watchers have been up watching continuous films since Sunday - without a crazy doctor with an eyedropper in sight. The movie marathon is taking place in New York for a reason: to break the Guinness World Record for consecutive hours watching movies. And there's an added bonus of a $10,000 cash prize, life-time subscription to Netflix and the all-important Popcorn Bowl Trophy. The list of the movies is as long as your arm, but notable films include: Iron Man (which went on first), Star Wars IV: A New Hope and Raiders of the Lost Ark. By the time everyone got to film number 40, The Bourne Identity, the insomniac film watchers must have been feeling just as confused as super-spy Jason Bourne. If the final two stay-awakes manage to get through 50 films, there's even a contingency plan of another 16 films, finally ending with Hairspray. Keep an eye of Netflix's Facebook page to see who eventually wins, one of the latest posts says that Suresh Joachim and Claudia Wavra are still hanging on. Crazy, crazy people.